Shiatsu is a traditional Japanese bodywork and massage therapy that uses gentle hand and finger pressure along the body’s energy pathways called meridians, stretches and joint rotation. It supports and strengthens the body’s natural ability to heal and balance itself. Shiatsu works on the whole person – not just with the physical body, but also with the psychological and emotional aspects of being. It is extremely relaxing and can help with various problems. According to oriental medicine, our physical and emotional problems have their origin in imbalances in the meridians, where life energy circulates. Shiatsu harmonises this energetic flow, relaxes the body and calms the nervous system. In this balanced state, internal self healing resources can function effectively to restore body and mind. Shiatsu is not to work on localised muscles and joints, but on the whole body, the overall energy system of the person. This is a main difference between Shiatsu and other physical therapies. During the treatment the patient feels completely relaxed and at the same energised. The receiver remains clothed during the treatment and wears comfortable clothing (t-Shirt/sweatshirt, trousers/leggings and cotton or wool socks). There is no oil used on the skin. Shiatsu can help with many problems like back and neck-shoulder pain, tension, fatigue, and works also complementary during chemotherapy and radiation. It is excellent for stress induced problems. If you have a special health problem it might be necessary to book several sessions (5-10). In general it’s a good idea to have regular shiatsu treatments (every two weeks, weekly or once per month) to keep well and ward-off ill-health. But you have not to be unwell to have a treatment. Many people receive Shiatsu purely for relaxation and enjoyment. Regular treatments may help to keep the body well and in harmony. At the end of a Shiatsu treatment you probably will feel bliss and harmony. Corinna Melinkat is a certified Shiatsu practitioner from the European Shiatsu School/Escuela de Shiatsu. 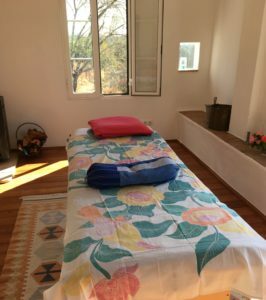 You can book for individual treatments or learn to give shiatsu in the foundation course with a certificate from the European Shiatsu School Spain.